The historic urban ensemble of the canal district of Amsterdam was a project for a new 'port city' built at the end of the 16th and beginning of the 17th centuries. It comprises a network of canals to the west and south of the historic old town and the medieval port that encircled the old town and was accompanied by the repositioning inland of the city's fortified boundaries, the Singelgracht. This was a long-term programme that involved extending the city by draining the swampland, using a system of canals in concentric arcs and filling in the intermediate spaces. These spaces allowed the development of a homogeneous urban ensemble including gabled houses and numerous monuments. 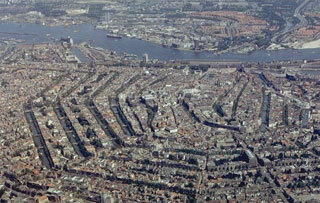 This urban extension was the largest and most homogeneous of its time. It was a model of large-scale town planning, and served as a reference throughout the world until the 19th century. This article uses material from UNESCO World Heritage List article "Canals of Amsterdam", which is released under the Creative Commons Attribution-Share-Alike 3.0 IGO License.